The Arts should be an integral part of every student’s education. Our highly qualified staff is enthusiastic to impart their expertise and love for the performing arts to students within the Kearsarge and surrounding regions. Our educational programs marry dance, music, and drama, and consist of classes in many of the various disciplines of the performing arts, including private music instruction. We’re not just another Dance Studio – we are educator’s in the performing arts! Our directors have master’s degrees or equivalent. Our senior staff members are professional artists who have performed in national and international venues. Our president and director of theater, our director of dance, and our director of music have a combined teaching experience of more than 70 years. Our teachers are all fully qualified, warm and friendly because they love to teach! Our facility has state-of-the-art floors, mirrors and equipment. At KCPA, our goal is to train our students in a non-competitive fun and loving environment that promotes excellence, self confidence and self discipline. 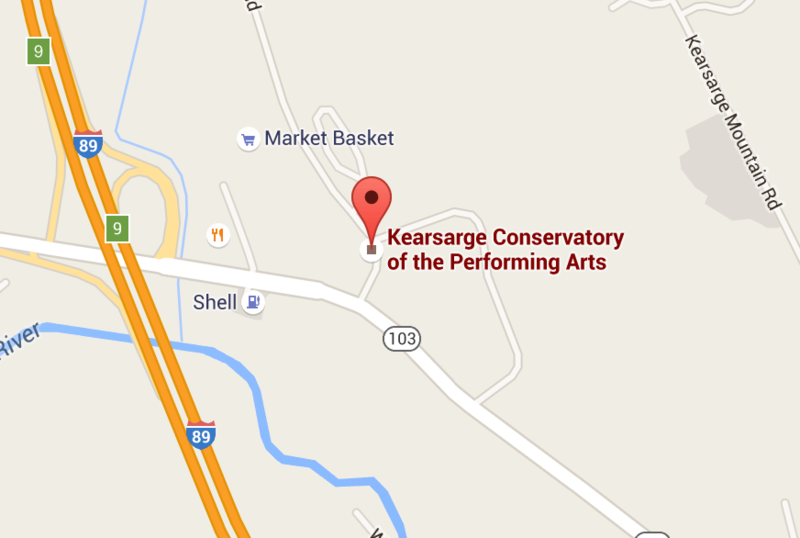 We work with and perform for the local community events to encourage harmony and good will within the Kearsarge area. We love teaching and training students of all ages from children 2&1/2 years old through adults. The Conservatory began here in the Kearsarge area of New Hampshire in 2004. Co-founders Kevin and Angela Tarleton have their Masters Degrees, and ran a similar Conservatory in Texas for 22 years prior to relocating to New Hampshire. Between the two, they have taught all ages and levels of performing arts as well as at universities and both national and international workshops. They also have logged thousands of hours performing in musical theatre, Shakespeare, classical theatre, contemporary theatre, children’s theatre and all forms of dance. They have two children, Alyssa and Jonmichael, whom have performed and taught with them as well. The Studio changed its name from Kearsarge Conservatory of Dance to Kearsarge Conservatory of the Performing Arts after Michelle Gosnell joined the team and started the music program. Michelle holds a degree in vocal performance, with thousands of performance hours and teaching experience. In 2014, Melissa Gendreau joined KCPA to provide hip hop, jazz, contemporary and tap classes. Melissa received her Bachelors of Arts in Dance from Dean College and her masters in Arts Administration from Drexel University. KCPA offers all levels and styles of dance, with a strong and professional focus on ballet & pointe. Many studios admit that they see ballet as a “necessary evil” or “an afterthought”. At KCPA, we understand that ballet is the basis of all dance, and vital to anyone planning to pursue the theatre arts. We also offer tap, Zumba & Pilates, tumbling, acro (which is more advanced combining tumbling with dance) musical theatre, private piano, voice and acting classes. KCPA offers an extensive pre-school program, with classes such as Pre-School Dance, Ballet/Tap Combo Class, Pre-School Music, Pre-school Tumbling, and a unique class by request from local families, Fun for Minies – a combo class that offers music, movement/dance and tumbling for children that are 2 1/2 year olds. While KCPA has a strong focus on technical training, we also strongly believes in fostering our students talents through performance, composition and creating. KCPA’s versatile programming allows us to better serve the communities of the Kearsarge region by providing something for everyone!